Time to get creative in the kitchen. We have a month’s worth of exciting dishes to inspire your meal plans. Start off with this better-than-takeout sweet and spicy chicken wings. 1. In a large bowl, mix all the dry ingredients for the rub. Add half the rub into a freezer bag with half of the chicken wings and shake to coat entirely. Add the remaining wings and rub to the freezer bag and continue to shake until evenly coated. Remove the chicken pieces from the bag, dusting off any excess rub, and place on a large platter. 2. Heat cooking oil in a large frying over medium-high heat. Once hot, add the chicken pieces and fry until cooked through, about 7 minutes on each side. Do not overcrowd the chicken. Repeat with the remaining batch until all the chicken pieces are cooked. Set them on paper towels to drain excess oil. 3. To make the sauce, heat a small pan over medium heat. Add the butter into the pan, once melted, add in the ginger and garlic. Stir for about a minute, then add in the honey, hot sauce, lime juice, soy sauce, vinegar, and water. Bring the sauce to a boil, stirring constantly. Next, add in the cornflour and continue cooking while stirring until the sauce thickens - about 30 seconds. Season with salt and pepper. Remove from the heat and set aside. 4. Transfer the chicken wings into a large bowl. Pour the warm sauce over the chicken wings and gently toss to coat. 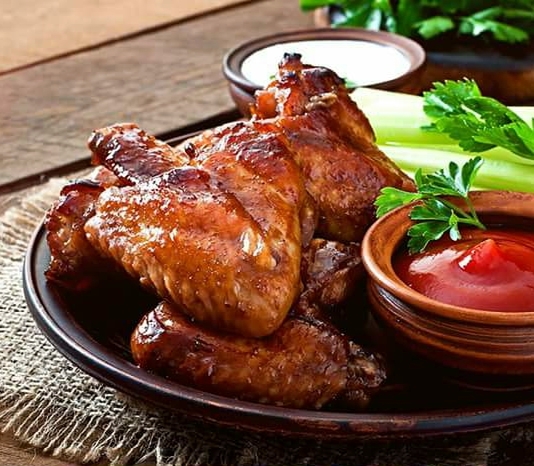 Sprinkle the chicken wings with freshly chopped spring onions, if desired and serve. *Tip: Make sure you have plenty of napkins in hand!